Is your small Atlanta apartment rental suffocating your style? Here are ten tips for the appearance of a spacious living area in a small room. Clear the clutter. A tip we mention often. Not only is it free, but you can make money by selling items you don’t need. 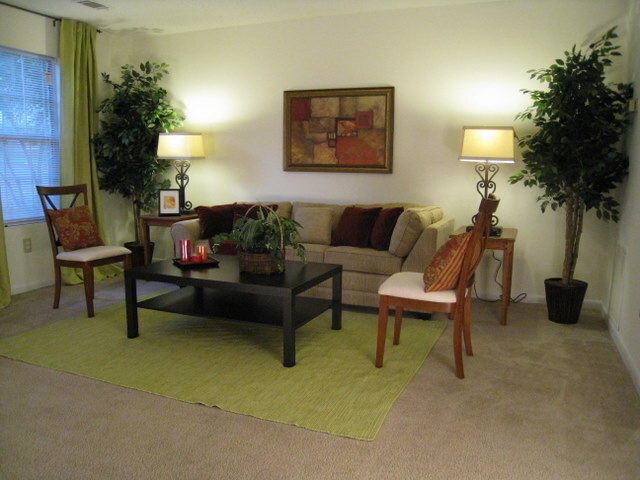 Use furniture with small straight arms or no arms and small rounded backs to give the illusion of more breathing room. Go for a round ottoman or coffee table. They are easier to navigate around in a tight place. Nesting tables can be pulled out when you need them and tucked away when you don’t. Make the most of vertical storage space. Not all apartments come with built-ins, but tall bookshelves work the same way. Mirrors can brighten up a room. Just make sure they reflect light and a view you love. Hanging curtains higher gives a room the appearance of being larger. Light up the corners. Floor lamps, sconce lights, decorative lamps all help illuminate dark corners. Keep things crystal clear with clear glass lamps and tables. Let the eye see all the space you do have in the room. JAMCO Properties provides affordable spacious 1, 2 & 3 bedroom apartments in the metro Atlanta area including Fulton, Dekalb, Clayton, and Cobb counties. Posted on March 16, 2013, in Communities, Decor, Organization and tagged atlanta apartment rental. Bookmark the permalink. Comments Off on Spacious Living Room without the Big Price.